Just last week we excitedly welcomed a new line of women’s apparel patterns by a very talented Portland designer, Peggy Mead. Her brand name is Sew House Seven, and she was kind enough to take time to answer our questions. It’s a fun read, enjoy! First, a bit about Peggy. I grew up in the small University town of Moscow Idaho surrounded by a creative family. I also went to college in Moscow and received my B.S. in Graphic Design at the U of I. I later went on to earn my M.S. in Apparel Design at Oregon State University. I went for a master’s degree with the idea that I might teach. My first apparel related job out of school was working as a temp for NIKE making bag patterns and sewing up prototype bags. I soon after worked at Jantzen as a swimwear pattern maker and later as a designer. As a pattern maker at Jantzen, I sometimes travelled to the Miss America pageants to fit our swimwear on the contestants. I also customized the pattern of a best selling Jantzen suit to fit Princess Diana. I was so tempted to write a message to her on the label but I refrained. I left Jantzen to freelance as a pattern maker and designer for several small companies and also had a short stint teaching draping at the Art Institute of Portland. More recently I have been working at Pendleton Woolen Mills creating sweater designs, print design, graphic tees, embroideries and many other types of surface designs for women’s wear. Currently, I have just launched my own sewing pattern business called Sew House Seven. I felt a need to get back tomy original passion of sewing and creating. DISCOVER IT AS AN ADULT? too wanted to learn. My mom eventually taught me and I was hooked! In junior high school I was given a clothing allowance of $100 or $200 (I can’t quite remember) but is didn’t go very far. That money had to last me the entire school year and that’s where sewing really came in handy helping stretch my budget. 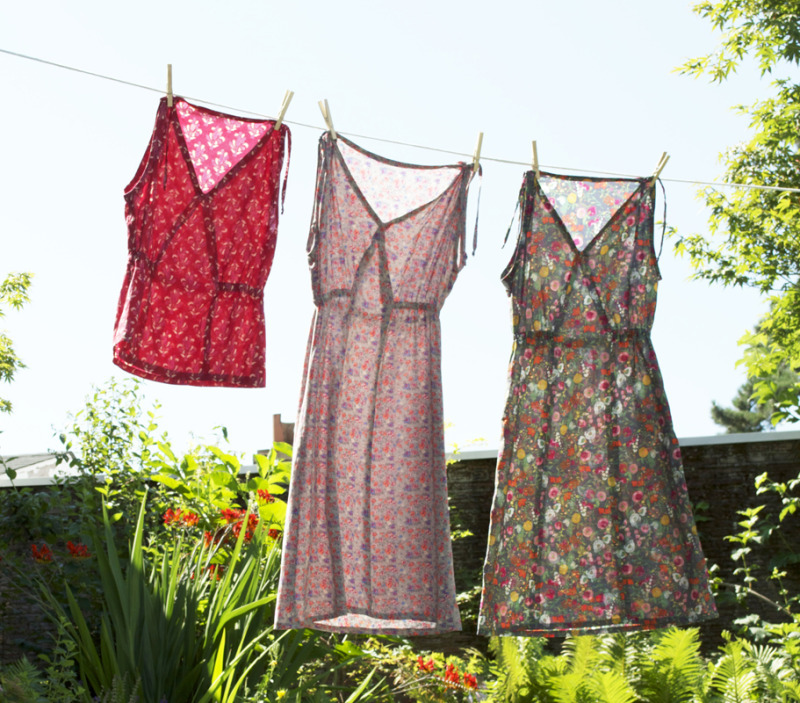 dresses for eight girlfriends. I didn’t make any money - I just loved doing it. where I received an M.S. in apparel design. the apparel industry I’ve decided to give it a go. be a spring board for other peoples creative projects. TELL US A BIT ABOUT YOUR NEW PATTERNS. I’ve been sewing for years, yet at this point in my life I have an extremely busy schedule with work, a child and a husband, as well as finding time for my outdoor sports. I still love to sew however, I find that if a project takes me more than a few days to finish, it may never get done - and I don’t think I’m alone in this. My goal with these first three patterns was to create styles that could be sewn up fairly quickly and easily yet still have some interesting design details. Although they are written for a beginner sewist, I hope the designs will appeal to sewists of all levels. Each design has a point of interest - the Alberta Street Pencil Skirt has the oversized angled pockets, the Mississippi Avenue has the front panel and the Bridgetown Backless has the draped open back (and is for knits or woven by the way). I also believe these patterns are versatile in that they can be made dressy or casual as well as span seasons depending on what fabric is used. The patterns themselves are printed on hard paper, and come in a 6.5” X 9.5” envelope with a detailed instruction booklet. The patterns will first be released as paper patterns but will later be offered as pdf downloadable ones as well. WHAT ARE SOME OF YOUR FAVORITE FABRICS/PATTERNS/MATERIALS TO WORK WITH? Although I started in the design field with the intent of making outdoor clothing for the sports I loved, I have since found that I really love designing and working with the more feminine and pretty things. I go through phases but currently I am loving silk, fine cottons, rayons and knits that have a nice drape to them. I am drawn to the rich color combinations of Kaffe Fassett. I also love vintage florals, liberty prints, conversationals and print mixing however, I can also appreciate a nice solid color fabric with some interesting texture. WHAT TRENDS IN PATTERN DESIGN HAVE YOU EXCITED? I try to stay away from styles that are too trendy however, every once in a while I get lured in. I am loving the trend of the easy and comfortable elastic waist. Does that make me sound like a lazy sewist? There are lots of nice tunics and shirt dresses out there I’d like to try. I’m really excited about seeing so many new independent pattern designers cropping up. I love to see so much creativity and people starting their own businesses. Lately, I haven’t had time to sew up much aside from my own pattern samples. I just finished a Mississippi Avenue dress out of a lovely fine cotton floral that I found at Bolt. I need to sew up a cover for our dinning room table bench that is peeling but I would rather sew up a pretty dress from a Deer and Doe pattern I bought a while back. I tend to frequent places I can walk or bike to so I haunt a lot of places near home. That being said, I’m loving what’s come about on SE Stark Street. I love the cocktails and fry bread at the Observatory. I love to shop at Branch Birdie and accompany my husband for coffee (I don’t drink the stuff) at the Bi-Partisan cafe (they also have yummy pies). When I venture out of my neighborhood, I like to eat at Prasad or Blossoming Lotus when I’m feeling like health food. My husband grew up in Thailand so we love to eat at Pok Pok. I crave the crusty, extra sauce pizza at American Dream Pizza and Staccato Gelato for the donuts. My all time favorite meal is at the Tacqueria Nueve - the ceviche caesar salad. I’m generally a vegetarian but that’s one of the dishes for which I’m willing to break the rules. I should also mention Movie Madness where my son and I like to rent old Godzilla movies as well as other obscure flicks. A huge thanks to Peggy for taking the time to share with us! You can find all three of her patterns at Bolt. Just in: yarn dyed heavy weights, apparel delights and more!